All available tickets for the 2018 World Cup finals in Russia have been taken, with Peru taking the 32nd and last ticket, after their 2-0 win against New Zealand. Europe: Russia, France, Portugal, Germany, Serbia, Poland, England, Spain, Belgium, Iceland, Switzerland, Croatia, Sweden, Denmark. Africa: Nigeria, Egypt, Morocco, Tunisia, Senegal. Central America: Mexico, Costa Rica, Panama. Asia: Iran, Japan, South Korea, Saudi Arabia, Australia. Firstly, each of the 32 teams will be separated into four different pots based on their FIFA world ranking. Pot one will contain each of the seven top-ranked countries including tournament hosts country Russia. Pot two will contain the next best teams and so on, until pot four. 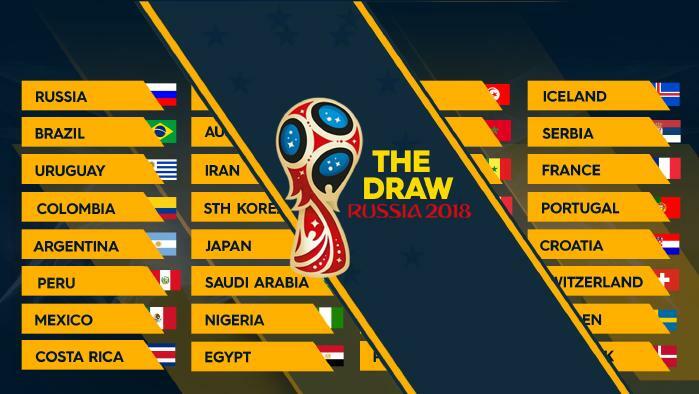 Following this distribution, all teams will be divided into eights groups of four, Group A-H, with host country Russia picking the first spot in Group A. Each team will play three times, then the top two will move on to the next round. The Super Eagles have proven themselves ready for whatever group they may fall into after they defeated Argentina 4-2 in a grade one friendly in Russia on Tuesday. The World Cup draw will take place in Moscow on December 1, 2017.